(Natural News) Nutritionist and yoga instructor Charlotte Watts says that different vitamin or mineral deficiencies are associated with long periods of stress. Most nutrients are used up more quickly in these periods as the entire body works at a higher and faster rate. She shared in an article on Healthista the seven signs of stress. Cracks at the corner of the mouth – When your lips are dry and cracked, especially at the corners of the mouth, you may be lacking in vitamin B6. This vitamin is needed for the production of the brain chemicals serotonin and dopamine, which regulate mood and motivation, and melatonin, which manages sleep. Therefore, these functions are compromised when stress is prolonged. To fight this deficiency, eat vitamin B6-rich foods like carrots, chicken, eggs, fish, and meat. Teeth grinding or jaw clenching – Also known as bruxism, teeth grinding means your body needs vitamin B5. This vitamin is often called the anti-stress vitamin because it helps in producing adrenal hormones, cholesterol, and immune antibodies. Taking vitamin B5 supplements or eating foods like beef, eggs, fresh vegetables, kidney, and legumes may help combat these symptoms. White spots on nails – This sign is often associated with calcium deficiency, yet can also be a sign of a zinc deficiency. Zinc is the most used mineral in the body. Increase your intake of zinc through dietary supplements or sources such as fish, meat, sunflower seeds, pumpkin seeds, and nuts. 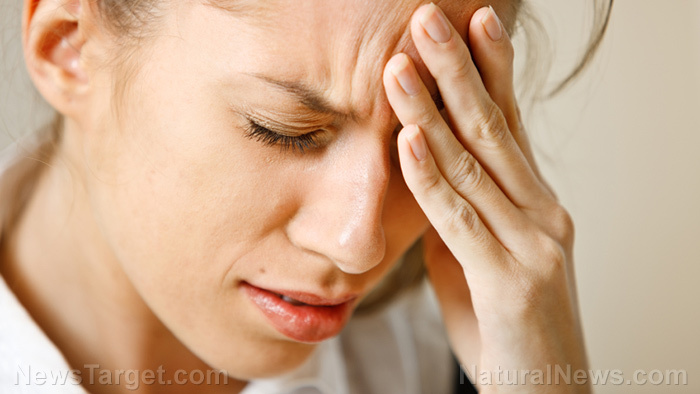 Constipation and diarrhea – This may be due to a magnesium deficiency. This mineral is used enormously during stress. A magnesium deficiency is associated with stress-related symptoms including anxiety, irritability, insomnia, depression, and muscle pains, such as in the digestive tract which then leads to constipation or diarrhea. Fight these symptoms by eating magnesium-rich foods like buckwheat, nuts, soybean, dark green vegetables, and carrots. Bleeding gums – Vitamin C deficiency may be the reason for your bleeding gums. It is massively used up during stress as it helps in the production of anti-stress hormones, interferon, and collagen. Berries, citrus fruits, green vegetables, asparagus, and avocados are great sources of vitamin C.
Hard pimples on the upper arms and legs – Vitamin E is an antioxidant needed for protecting fatty body areas. When you lack this vitamin, hardened, raised pimples at the upper arms and legs will appear. Eat vitamin E-rich foods such as cold-pressed vegetable oils, dark green leafy vegetables, legumes, nuts, and seeds, to prevent deficiency. Repeated throat and chest infections – This may be caused by a vitamin A deficiency. The vitamin is also important for the health and resiliency against infection of the skin and the tissue linings in the respiratory, gastrointestinal, and urinary tracts. Throat and chest infections can be prevented by eating more green vegetables and high-quality organic meat. Stress should not be taken lightly as it will affect your entire well-being. It does not only disrupt your emotional well-being, but your physical well-being as well. Your ability to think, function, and enjoy life are compromised when you are stressed. Handling stress efficiently is important to live a happier, healthier, and more productive life. This can be achieved by finding balance in life — work, relationships, relaxation, and fun. Changing your reaction to stress, or what causes it can totally alter the body’s chemistry, enhance health, and strengthen relationships with others. Find out more about stress and its causes at Psychiatry.news.